Middle and high schoolers throughout the school district took a stand for students across the country who feel they cannot speak freely about their orientation, those who have been bullied, and those who have been permanently silenced by suicide, by participating in the Day of Silence on April 12. This day was organized nationwide in collaboration with the Gay, Lesbian & Straight Education Network. 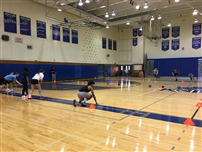 EMS has been participating in the event for the past few years and had over 80 students sign up to participate this year. Each student who signed up was given dry-erase boards in order to communicate when necessary throughout the day. For students who were unable to be silent for the day, rainbow pins and stickers were made available to show their support. Throughout the day, students through walked the halls with encouraging messages, such as “speak up for what’s right” and “equality rocks”, written on their white boards. The day not only served to bring awareness, but also as an effort to continue building a welcoming and accepting climate free of hurtful slurs and bullying. The John H. Glenn High School community observed the day, officially, for the first time. The Elwood Knight, redesigned with a rainbow plume donning his helmet and the word “silence” engraved into his sword, was printed on t-shirts and worn by many members of the faculty and staff. Those staying silent for the day were able to silently deliver instruction to their students, as well as students being able to respond to lessons without speaking by way of Google Classroom. Additionally, inspirational speaker Jared Foxx visited John H. Glenn to break the silence and speak openly about the oppression that the LGBQT+ community faces, and how we can show kindness and support to one another. View a video from EMS on the Day of Silence below. In addition to serving as president of the Suffolk County School Superintendents Association, Superintendent of Schools Dr. Kenneth Bossert has been elected to serve on the executive committee of the New York State Council of School Superintendents. According to its website, NYSCOSS is a “professional and advocacy organization with over a century of service to school superintendents in New York State.” The Council advocates on a state and national level for public education, as well as provides its members with numerous professional development opportunities. As a member of the executive committee, Dr. Bossert will help to recommend education policy to the House of Delegates and conduct business between meetings of the House of Delegates. Congratulations to Dr. Bossert on this extraordinary accomplishment! 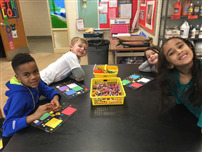 The district recently received over $36,000 in grant money thanks to the dedication and fundraising efforts of the Elwood Education Endowment (EEE)—a not-for-profit organization dedicated to enriching educational opportunities for the district’s students. Teachers and administrators throughout the district composed grant applications for review by the EEE’s grant committee. Each went through an in-depth evaluation, and nine were selected. At the district’s April Board of Education meeting, recipients were honored for their grant-writing efforts, as well as the vision they have for their students. EEE president Deena Purow was in attendance to present each recipient to the Board. Those honored, along with their winning grant titles, include: Krista Albrecht, Dash into Harley; Brittany Chalmers, Robotics in Computer Science at JGHS; Megan Gieser, Jessica Kennedy and Doris Smith, Flexible Seating to Foster True Engagement and Collaboration; Eileen Kelly-Gorman, Greenhouse Restoration Project; Eleanor Grady and Amy Lindenbaum, Creatively Containing Colorful Chaos; Richard Greening, Expansion of Science Department Vernier Probes Initiative; Kathleen Marinelli, A Mindful Journey into the Garden - Rooted to the Core; Kathleen Marinelli and Lisa Rosenthal, Cooking up a Lifetime of Essential Skills; and Frank Schiraldi, Health and Wellness "The New Norm”. 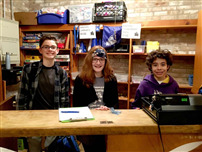 Recently Elwood Middle School students finished up a different kind of March Madness tournament—one with books! In order to make this book-tournament a success, middle school librarian Donna Fife had teachers nominate books for their kids. Ms. Fife tallied up the most recommended books and included books that had high circulation records as well. Ms. Fife then paired up books that would do well against each other—graphic novel against graphic novel, best seller against best seller—and had students vote, using Google forms, which books they thought seemed most interesting. Because most students had not read every book, each was listed with a summarizing blurb. Each round had over 300 students vote for the books they were rooting for, which was an incredible amount of student participation. As the tournament progressed, students became more invested, stopping by the library to ask which books were in the lead. In the end, two best sellers went head to head, and a Dog’s Purpose won by a single vote. Packets of information for your use in seeking election to a seat on the Board of Education in the Elwood Union Free School District may be picked up at the District Office or at a Board of Education Meeting from the District Clerk. There is one seat available for a three-year term commencing on July 1, 2019 and expiring on June 30, 2022. The Board member election will be held on Tuesday, May 21, 2019, the same time as the District’s Budget Vote on the 2019-2020 school budget. Please call Mary Lou Janelli, District Clerk, for more information: 631-266-5400, extension 1402. Paquetes con información para su uso en búsqueda de un puesto en la elección en la Junta de Educación en el Distrito Escolar Libre de Elwood puede ser recogida en la Oficina del Distrito o en la reunión de la Junta de Educación del Secretario/a del Distrito. Hay un puesto disponible por un término de tres años comenzando el día 1 de julio del 2019 y terminando el día 30 de junio del 2022. La elección del miembro para Junta se llevara a cabo el martes, 21 de mayo del 2019, al mismo tiempo que el Voto del Presupuesto del Distrito Escolar para los años 2019 – 2020. Llame a Mary Lou Janelli, Secretaria de Distrito, para obtener más información: 631-266-5400, extensión 1402. *Grade 8 Science: students in Earth Science do not take the Science Assessment; they will take the Earth Science Regents on Thursday, June 20, 2019. At the district’s March Board of Education meeting, two outstanding groups of students were recognized for their recent academic accomplishments, along with two outstanding Elwood Middle staff members who jumped into action, while showing such compassion, for a student in a recent moment of crisis. A group of Elwood-John H. Glenn research students were commended for receiving the “Best Presenters” award at the Northwell Hospital-Feinstein Institute’s annual Medical Marvels Competition. The team, advised by Dr. Arnold Kamhi, included Sasha Jamal, Julia Mady-Aguiar, Devin Lee, Rithika Narayan, Brennan Finnegan, and Jake Haddad, and each student was presented with a certificate from the Board for this accomplishment. John Glenn’s Mock Trial team, also known as Knight Court, was recognized by the Board for making it to the county’s “Elite Eight” round of the New York State Mock Trial Tournament. After four previous rounds of competition and just as many victories, they entered as the top seed in the county. Though Knight Court did not make it to the final round of the competition, they had an impressive season that marked the fourth year in a row making the county’s “Elite Eight”. Additionally, Mock Trial advisor Ms. Megan Geiser was honored for her dedication to the team, and helping them reach the “Elite Eight” for the past four years. Lastly, Elwood Middle School Assistant Principal Dawn Valle and nurse Lisa McNamara were commended for expertly and compassionately taking care of a student in a moment of crisis. JGHS student Ben Farina recently competed in the Brookhaven National Labs Annual Bridge Competition and received the Aesthetic Award for his design! Ben, along with 26 other classmates, qualified for the competition earlier in 2019. Upon qualification, each student immediately went to work researching bridge designs. After settling on a design, students turned their ideas into sketches, sketches into digital copies, and then the digital copies into physical bridges. Ben’s bridge design in particular was deemed the most aesthetically pleasing at the competition, and was awarded a plaque from Brookhaven National Lab. While over 50 students from nine schools qualified to participate in this competition, 27 students of those students were from John H. Glenn. JGHS students involved in the Habitat for Humanity club recently volunteered to help build the frame of a new home for a family in need on March 13. Alongside other volunteers from Brookhaven National Lab, the family receiving the house, and Habitat for Humanity of Suffolk staff, students worked with determination and speed from 9 a.m. until 2 p.m. to complete the frame. In addition to this act of service positively changing a family’s way of life, the structure itself will be one of the organization’s most environmentally projects yet. This “GeoThermal” house will have the ability to be heated and cooled by the earth’s underground temperature, rather than gas or oil. This project was organized by Habitat for Humanity of Suffolk. John H. Glenn’s American Sign Language (ASL) program has been steadily growing over the years—starting with one small class and now boasting over 90 students across three high school levels and one college level. Students enjoy having this language to explore, and are vocal about the importance and necessity of having people who can interpret for hearing impaired individuals. “People are often inclined to gravitate towards taking Spanish because that seems like a more practical route to take,” said Megan Hovanec, a level-two ASL student, “but that’s not necessarily the case. With the number of deaf Americans in our country, ASL is something that everyone should have a basic knowledge of.” Meagan plans to double major in interpreting and nursing in college so she can use ASL in the medical field. The community of ASL students at John H. Glenn enjoy giving back to deaf the community each year by Fall Festival at Mill Neck Manor School for the Deaf, participate in district-wide events like International Night, and put on some of their own events, such as ASL Idol. In response to being chosen to pilot a county-deployed recycling program, students at James H. Boyd have been stepping up to the plate to help save the planet. Members of the student council have been especially important in keeping the program running like a well-oiled machine. Each week, council representatives collect the recycling bins from each classroom—one paper, one plastic—to weigh and record. Students take care of the paper, while the school janitors record how many bags of plastic have been removed. At the end of the month, the information is sent to the county. So far this school year, Boyd has recycled over 2,000 pounds of paper, which has saved approximately 17 trees. 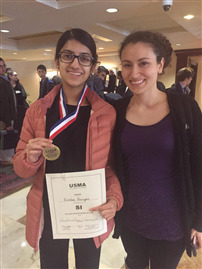 A team of JGHS student-researchers recently won the best presentation award at the Northwell Hospital-Feinstein Institute’s annual Medical Marvels Competition. This collaborative research competition is for ninth and tenth grade students across the island who are seeking to pursue careers in the fields of science, technology, engineering, and math (STEM). 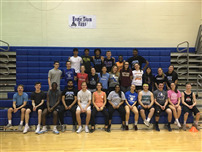 The team was comprised of sophomores Sasha Jamal, Julia Mady-Aguiar, Devin Lee, Rithika Narayan, Brennan Finnegan, and Jake Haddad. Collaboratively, the students wrote a fourteen-page paper on the harmful effects of vaping and proposed a resolution to the high school vaping crisis across New York. After presenting in competition with 37 other teams, they were awarded the best presentation award. 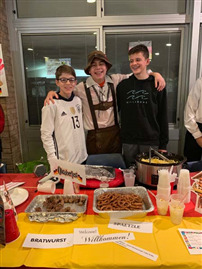 On Wednesday, March 6 the Elwood community came together to celebrate heritage and culture at a district-wide International Night. Groups of students set up booths to represent different countries. Students served authentic cuisine to those in attendance throughout the night, thanks to the generous donations of students from James H. Boyd, Elwood Middle, and John H. Glenn. While there were over 22 stations incredible stations, South Asia—presented by Sasha Jamal, Rithika Narayan, Tanay Rametra, Arianna Surujbali, Riya Kumar—was named the winner. Italy, presented by Abby Rothleder, Ally Haddad, Joey LaCorte, Jake Ribowski, came in second. Different student groups showcased well-practiced performances, including the Boyd fourth and fifth grade chorus, the EMS sixth grade World Culture classes, Melissa Mandel solo of "Black Orpheus,”, Ms. Gendjoian's Spanish Conversation class, the JGHS Step team, and Mrs. Correia's ASL class. As a finale to the night, the American Sign Language students (levels 1-4) performed a moving rendition of “This is Us”, accompanied by the vocal talent of sophomore Princess Onyianta. A great night celebrating heritage and different cultures was had by all. To watch Melissa Mandel’s performance, click here. To watch the ASL performance, click here. When Ninja Warrior Junior first aired, David was automatically hooked. He knew he wanted to become a warrior, and began practicing by “literally climbing the walls” of his house. After taking his skills to the next level at a ninja gym, David felt confident to submit six videos showcasing his athleticism to an open casting call of the show—and was selected. Each week he puts in over ten hours of gymnastic and climbing practice. David believes he’s prepared to take on the semifinals, which will air April 6. He mentioned that, while one of his favorite things about competing is the weightless feeling of falling through the air, he has thoroughly enjoyed the camaraderie with the other members of the show. “It’s been really awesome to meet and get to know other people with the same specific interest that I have,” said David. Congratulations and good luck, David! Tickets are now on sale for the high school musical Hairspray! Performances will be held on March 15 and 16 at 7 p.m. in the Elwood John Glenn auditorium. Tickets are $12.00 online, $14.00 (cash and check only) at the door. To purchase tickets, go to https://ejghsmusical.ticketleap.com/hairspray. 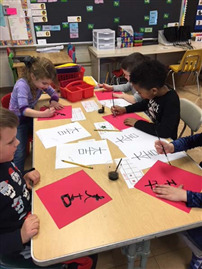 Kindergarteners at Harley Avenue enjoyed exploring different art styles and cultures during the month of February in Mrs. Chris Warren’s art classes. One of the styles students learned about was Mondrian, a modern art style that uses shapes to represent the streets of New York City. 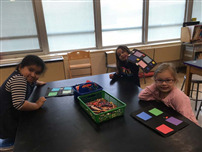 Kindergarteners were challenged to use 100 squares in their work to represent the 100th day of school. 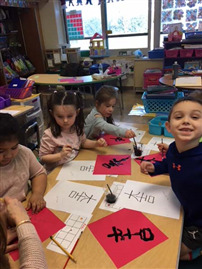 Students also learned about and celebrated the Chinese Lunar New Year by learning to paint “Good Fortune” in Chinese characters. 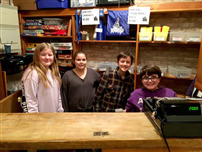 Members of Elwood Middle School’s student council recently worked with Life Skills students on the grand re-opening of the school store on Feb. 8. The store, previously run by the PTA, hasn’t been open in a number of years, and will now be run by the students, for the students. Special Education teachers Martine Pirolo and Megan Riley worked with the student council and Life Skills students to teach and practice important basic skills that they will need in the future, such as handling money, greeting customers, counting inventory and more. Once up and running, the store will be run by rotating groups of volunteer students each week. Detective Pape and the NYPD jazz band visited Harley Avenue and performed for students on Feb. 7. Members of the band introduced the students to different styles of jazz music, and showed them how each of the instruments worked. The students listened to the music, sang along and danced. The entire school participated and had a blast. The event was set up and organized by one of Harley parents, Lisa Tuozzolo. Harley Avenue is thankful to have had such a wonderful afternoon with the band!